I’ve been wondering how I would find a way to get to Troy & Stacy Hadrick’s place on the prairie for years. I met Troy on Twitter forever ago and started catching him as a variety of meetings here & there almost three years ago. 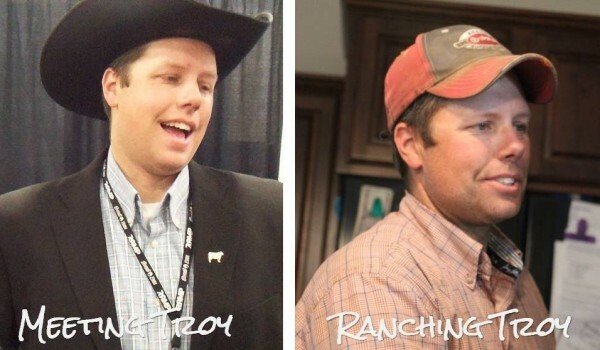 Hearing his stories and meeting Stacy a bit later, I thought I had to see the place these two were so passionate about that they were willing to spend time away from it to help be sure a ranching/farming future would be possible for their kids. Yep, as Stacy would probably say, her cowboy cleans up real well. And while on the surface it may seem like they are almost two different people — and believe me, when Troy came in from work, I did have to wipe my eyes to be sure that was him under the dirt that had stacked up on him throughout the day. It’s clear what motivates Troy, no matter what his clothes look like. 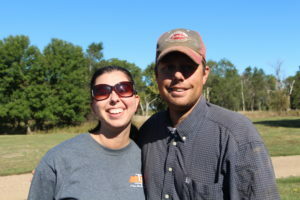 He and Stacy love living on and working on the ranch. And they love their family. And they want to see a path for a successful future for both. The creek that will hopefully get fed a lot more water soon. The pasture where they keep the cows. 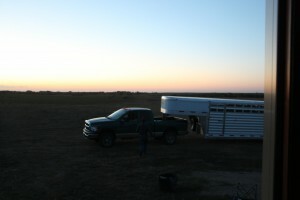 Other pastures where cattle get moved around on to feed (they weren’t too green though). The feedlot where calves will be kept this winter, providing ready access to food and the ability to monitor the calves health. The headquarters where equipment is maintained and kept until needed. The holding pens for livestock that have any issues that need to be watched closely and for the young calves the kids are caring for. Fields where his cousins manage crop production. Stacy picked up where Troy left off showing me the town and after that, took me back to the ranch to see what Troy & the guys were up to weaning cows. She took time to help me understand what I was watching, let me ask a whole bunch of questions (some of which had to seem like dumb questions I am sure). I learned a lot and I have to say, I really got to know my friends Stacy & Troy a lot better too! The video shows what I saw there. Those sunrise photos are breath taking. 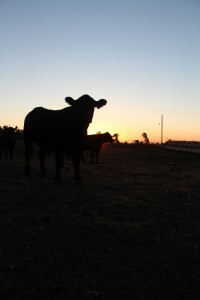 I think there’s just something amazing about ranch life. I know it’s hard, but it would be so amazing to do it. And yes, the winters are hard here in the midwest! Thanks! I really was moved being there with Troy & Stacy. They are such incredible folks. Lucky to call them friends.